All transactions are safe and secure with a reliable history in online purchasing behind each of our associates. Buy the Klingon, Do You Speak It?! t-shirt to own Pulp Fiction clothing and merchandise. The front of this tee features a play on Jules' "English, do you speak it?!" quote from Pulp Fiction. Instead of English, here, Jules is asking whether you speak the extraterrestrial humanoid language Klingon from Star Trek. This funny Pulp Fiction shirt is a great way to add a little geek flavor to your love of the Quentin Tarantino classic. 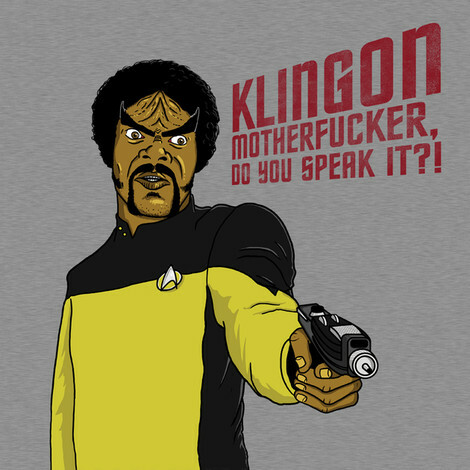 In addition to the Klingon, Do You Speak It?! tee above, browse the Pulp Fiction Clothing Gallery for more apparel like men's and women's clothes, kids shirts or hoodies.